Innovation is at the core of the company’s vison, and its iOPS programme draws upon the expertise of the workforce and supply chain to deliver enhanced operational capability. As part of this process a strategic review was carried out in 2015 to identify areas for improvement within its Waste Water Services. The review highlighted key areas where the resolution of issues such as blockages and leaks could be improved through faster response times and the ability of operatives to do more in single site visits. By switching to single-man operated units; reducing the overall vehicle and jetting unit weight, and equipping operatives with tools such as drain CCTV kits, it was clear that enhancing service delivery could work hand-in-hand with realising operational efficiencies. As part of the process, long-time supply-chain partner Kensway Engineering was approached. An approved supplier of Rioned equipment, the firm quickly identified the Rioned Aquajet and CityJet as the best solution to tackle the SWW requirement. Kensway worked closely with SWW and Rioned in designing a solution that was lighter and more efficient, before equipping a test vehicle to demonstrate that a compact unit that prioritises minimal pressure loss can be equally effective as using a less efficient larger unit. Project roll-out began in early 2017, with the first set of 15 fully converted jetting vans delivered to SWW in March. By provided training, new equipment and upgrading existing jetting equipment, the capacity of the existing team was doubled. Radenko Danilovic, Project Manager for South West Water, has played an instrumental part in the project from the outset, and says the new vehicles and equipment meant a fundamental change in the way the teams operate. 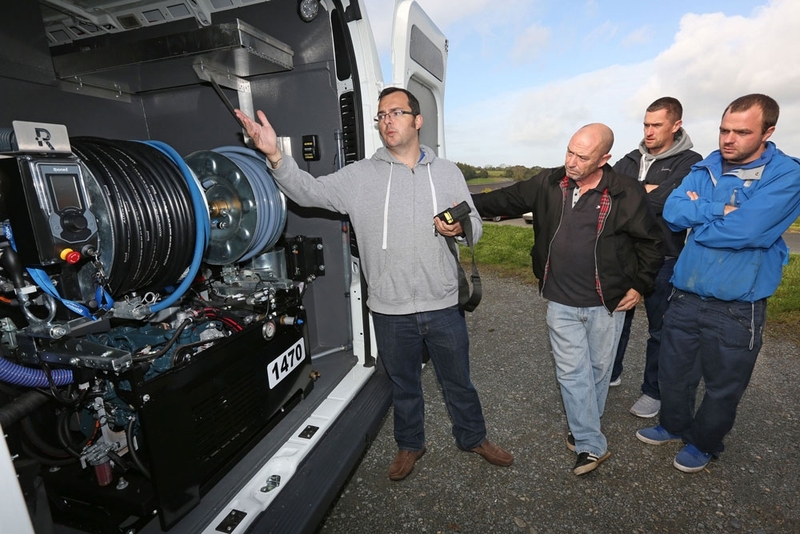 The second stage of the project roll-out was delivered in October 2017 and enables single-man operation across the entire SWW Waste Water Services team. 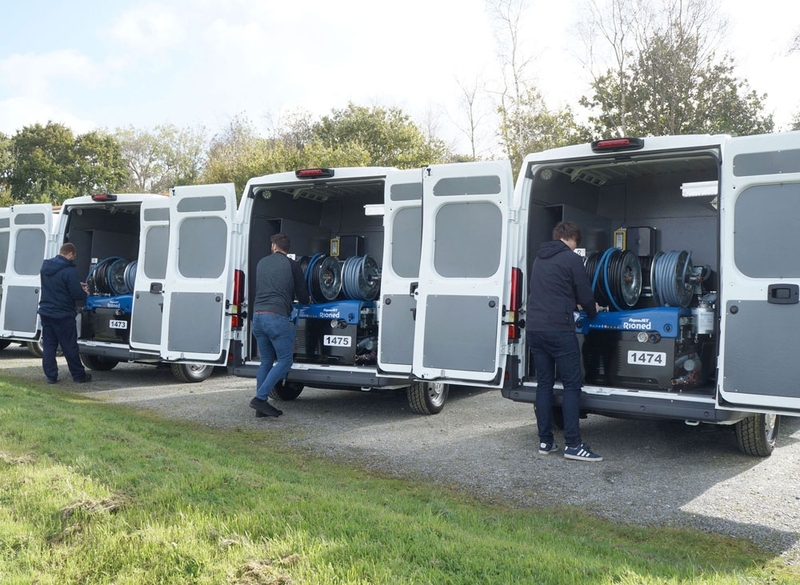 This includes six vans installed with Rioned CityJet units and 30 vans with AquaJet units, all equipped with Riomote remote control, eControl panels, 100 metres of high-pressure hose, full nozzle kits and CCTV equipment. Kensway undertook the vehicle design and conversion, included installation of high-quality aluminium storage spaces, welfare equipment and a durable, lightweight waterproof spray lining. Ken Burton from Kensway Engineering explains that feedback from his customers is always of the most value: “I’m proud to hear that all the effort is paying off and the jetting units are performing even better than they expected. The quality of Rioned is showing through. The MultiJets they are using are already 10 years old. We just refurbished those with remote control to make it ‘single-man-proof’. I’m proud of our cooperation and looking forward to continuing that over the coming years." The capability of operatives to resolve issues in a single site visit is at the core of SWW’s customer service philosophy. The fully equipped van mean that CCTV investigations and jetting can be carried out in a single visit, and customers and management can be informed about any requirements for additional work while the operatives are on site.